I was full of good intentions to resurrect this blog on the return visit to Japan. The blogging didn’t happen but the Japan trip did, in November for 3 fabulous weeks with two potter friends who were also with me the first time. 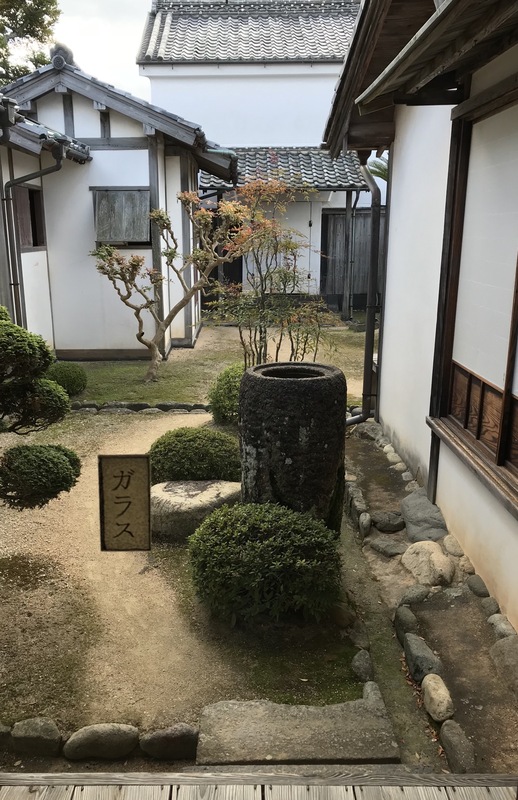 Non Potting Partner declined to come with us, a wise decision on his part, we did visit a lot of pots in our journey, and temples, food and best of all, after the pots – onsen. We started in Hagi. A late addition to the itinerary, included when we realised we could get a connecting flight from Haneda airport to Ube. Hagi ware hasn’t featured much in my searches about Japanese ceramics, but it should have. 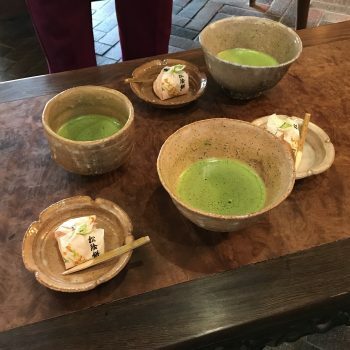 It is where the influence of Korean ware is seen most keenly and is considered second only to Raku ware for tea ceremony utensils, or so I read. To be honest I have never really understood the appeal of these very plain sometimes ungainly bowls, prefering instead the raw energy of Shigaraki pots and the immediacy of Raku ware. 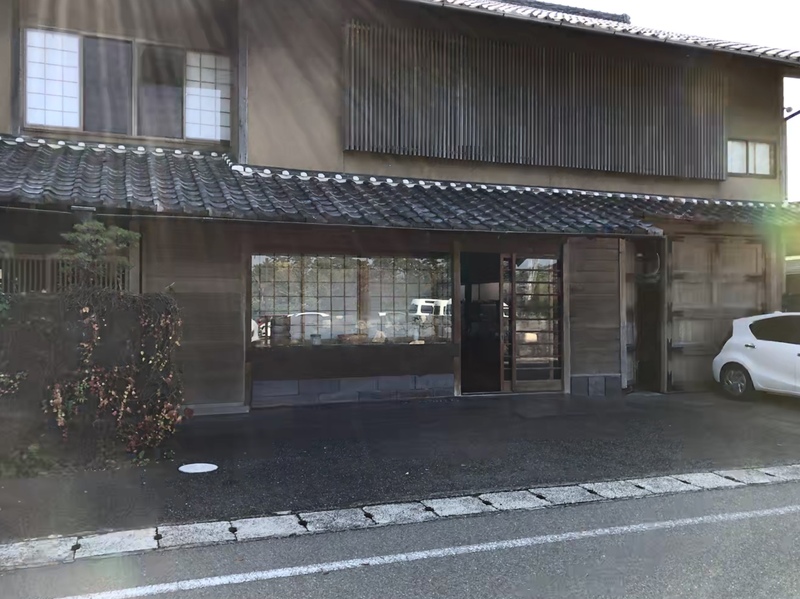 So I thought it would be a challenge to see the work for real, (for the same reason I was glad of the chance to visit Inbe to see Bizen ware, more of that later). The town is a perfect place to spend a couple (or more) of jet lagged days in early November. Warm like a Scottish summer, the Sea of Japan lapping gently on empty beaches. We hired bicycles and set off around the quiet streets, trying to avoid the deep storm drains (terrifying on wobbly bikes), in search of pots. The old town is delightful, ancient patinated walls, extreme pruning, temples and samurai houses. 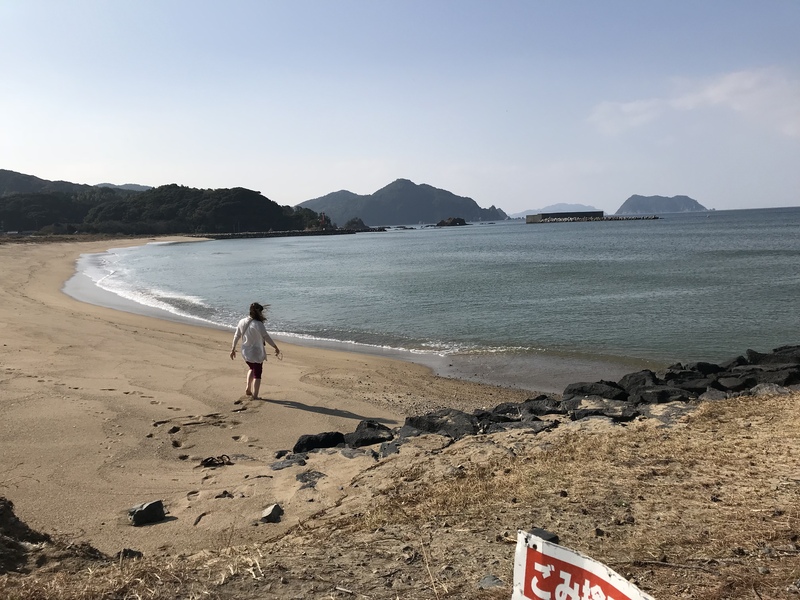 Hagi beach on the Sea of Japan, early November. By sheer fluke (too jet lagged to plan much) the first pottery we found was fabulous. Hagi pottery is a slightly porous stoneware, glazed with rice straw ash glaze. During use, it absorbs liquids which stains the ware developing a fine network of crackles. Much of the best work is quiet and subtle, white to beige glazed, semi transparent to opaque, occassional blushes of chun like blue, areas of pinkish spots (gohon) appearing through the glaze which develop around imperfections in the clay. There is a lot of pottery with these spots in the town, a lot of it naff but the best is beautiful. It comes down to the subtlety of it. And the rather unexciting beige looking glaze is a sensational foil for the green of matcha tea. 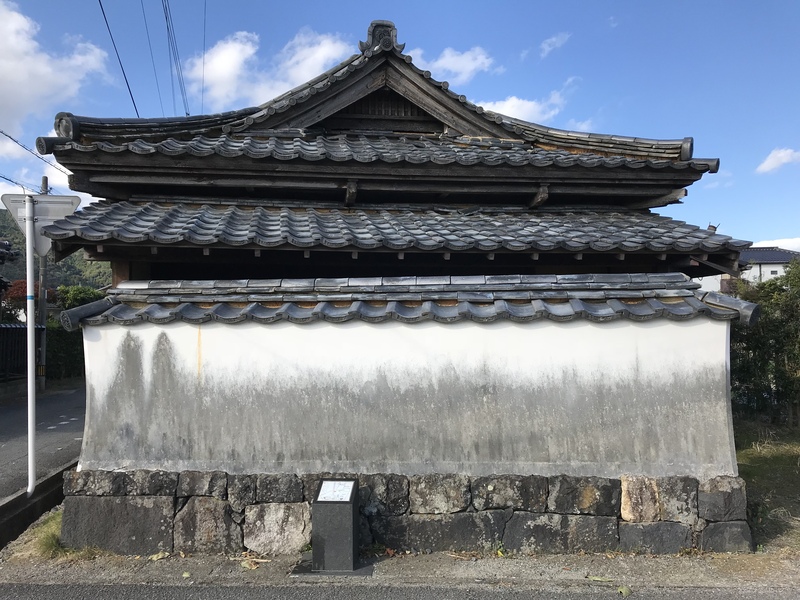 The development of Hagi pottery has a long and controversial history involving bringing potters from Korea. 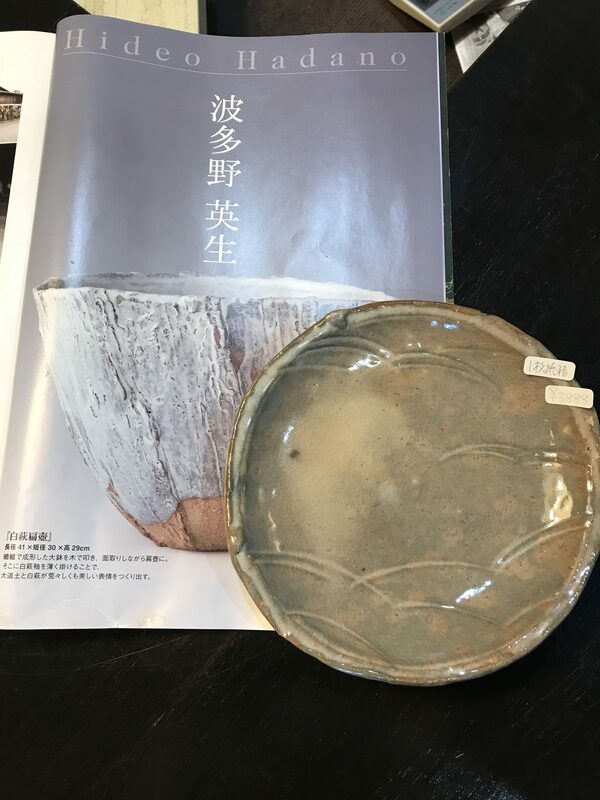 In the Keicho era, about 400 years ago, Lord MORI Terumoto ‘invited’ two Korean brothers to settle down in Hagi and introduce the Korean pottery and techniques from the Koryo dynasty (Korai in Japanese, 918-1392) This pottery was appreciated by tea masters for its natural and ordinary beauty. Tea bowls developed from the simple rice bowls, with their imperfections and flaws from the making and firing of the bowls much admired. We also visited Senryuzan the noborigama kiln of Yoshika Hatao with its showroom and museum of substantial ancient and contemporary work. Here I found a tea bowl in the Hagi style which I could afford and although still unconvinced, still jet lagged and on our first full day of a 3 week study tour, swallowed my doubts and bought it. I know it’s not by Yoshika and I can’t find my note of who did make it, but that just adds to the challenge of learning to appreciate the humble bowl.